Real star gazers know that to enjoy some radical astronomy, you've got to get away from city lights. 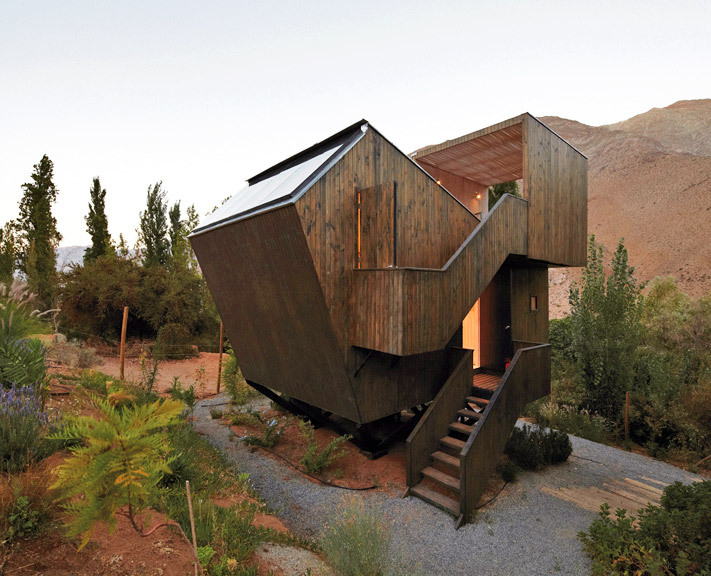 Elqui Domo, a tiny hotel retreat situated in Chile's Valle Del Elqui, is hemmed in by the massive Andes Mountains, making it perfect for nature lovers. A recent renovation by architects Rodrigo Duque Motta utilizes lighter-than-air textiles to turn this tiny mountain retreat into a night-sky paradise. Elqui Domos was originally built about 10 years ago in an area known for amazing weather and night sky views. It consisted of some small cabins and a series of small geodesic dome-like structures with fabric roofs. Small hatch flaps were sewn into the fabric so that guests could watch the stars from the comfort of their own rooms. The hotel owners wanted to upgrade the hotel with a more modern feel, so they asked Martin Holmes, Catalina Ventura, and Jorge Siviero to remodel the existing seven dome cabins and the restaurant lobby, in addition to constructing several new cabins that would maximize the site’s appeal for all types of travelers. According to the design team, the biggest challenge was improving the domes’ living conditions while highlighting the elements that make the hotel so unique. The new cabins continue the weightless feel established by the dome huts by utilizing stilt-like foundations that barely touch the land. This technique also allowed the cabins to be placed to suit the valley’s topography changes –between the vast vegetation of the valley and the harsh, dry mountain overhang. Two opposing walls made entirely of windows expand the space’s feel while allowing guests a constant line of sight to the mountain peaks. The new accommodations also feature a rooftop deck, so that even those not brave enough to stay in a dome can come face to face with the brilliant stars. Elqui Domos was originally built about 10 years ago in an area known for amazing weather and night sky views. It consisted of some small cabins and a series of small geodesic dome-like structures with fabric roofs. Small hatch flaps were sewn into the fabric so that guests can watch the stars from the comfort of their own room. The hotel owners wanted to upgrade the hotel to a more modern feel, so they asked Martin Holmes, Catalina Ventura, Jorge Siviero to remodel the existing seven dome cabins and the restaurant-lobby, in addition to constructing several new cabins that would maximize the site's appeal for all types of travelers. According to the design team, the biggest challenge was improving living conditions while highlighting the elements that make the hotel so unique. The new accommodations also feature a rooftop deck, so that even those not brave enough to stay in a dome can come face to face with the brilliant stars. The new cabins continue the weightless feel established by the dome huts but utilizing stilt-like foundations that barely touch the land. This technique also allowed the cabins to be placed exactly where the valley's topography changes –between the vast vegetation of the valley and the harsh, dry mountain overhang. Two opposing walls made entirely of windows expands the space's feel while allowing guests a constant line of sight to the mountain peaks.